1.Freeze coffee in an ice cube tray until firm, at least 4 hours or overnight. 2.Combine the frozen coffee cubes, milk, cocoa, maple syrup to taste and vanilla in a blender. Pulse until smooth, adding plain ice cubes if you want it thicker or a little water if you want it thinner. Divide between 2 glasses, dust with a little cocoa powder, if desired, and serve immediately. 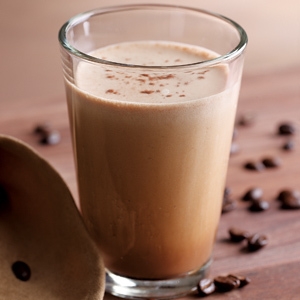 •Tip: Double-strength coffee or espresso gives you the best coffee flavor when making blended or iced coffee drinks. If the coffee isn’t strong enough, the drink will taste watered-down. To brew double-strength coffee, use twice the amount of grounds as you normally would for a regular cup of coffee. Espresso is strong enough brewed regularly.